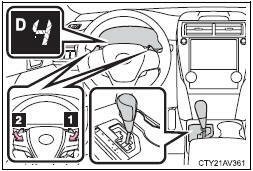 To drive using temporary shift range selection, operate the “-”paddle shift switch. The shift range can then be selected by operating the “-” and “+” paddle shift switches. Changing the shift range allows restriction of the highest gear, preventing unnecessary upshifting and enabling the level of engine braking force to be selected. The selected shift range, from “1” to “5”, or “D” will be displayed in the meter. To return to normal “D” position driving, the “+” paddle shift switch must be held down for a period of time. When a shift range higher than “5” is selected, the shift range will return to the normal D position.